Welcome to our Best of D'lite site. 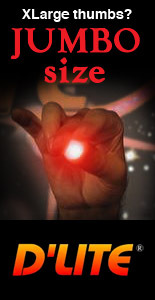 We hope you enjoy our newly updated website featuring the widest variety of D'lite Magic, as well as exclusive D'Lite magic props only available here including the best magic effects. Also please browse the news articles and letters in the Magic News and archives section. Our updated website is finally done, although it is always a work in progress. We worked very hard on getting the site done so that there was no interruption in service. I think we successfully did that since we had many sales in between the process and everything went smooth. If you find anything strange or not working correctly on our website, please let us know through our contact us link. We are constantly adding to our website so please visit often. We try to make it entertaining and informative, while bringing you the best magic we have to offer at great prices. We appreciate your calls and business so if you have any questions about our products please don't hesitate to ask. You can use our contact link or give us a call. Our phone number now has a live person answering. For those of you that had trouble getting through the phone with messages, please try again. In the works and coming soon… For those that have signed up with us, purchased an item and after you have received it, you will be able to personally download FREE magic trick ideas and instructions for that product. After you have received the product we will send you the link. This link will also be available to you in your account. We will send a newsletter when this service is available. It's in the works now. Our prior customers will also get a link to their products that they have already purchased. There's nothing more special then making another person smile, laugh and bring less stress to everyday life. It's A gift to life, not only to others but to yourself. More smiles, less stress means less health issues through mind over matter. Give yourself a pat on the back for this important act of life. The reward of seeing someone else smile and being amazed is a great feeling of accomplishment and fun too.